The Lovecraftsman: Fantastic H.P. 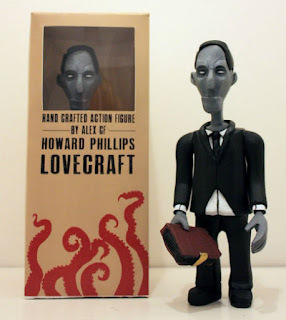 Lovecraft action figure comes complete with a tiny Necronomicon! Fantastic H.P. Lovecraft action figure comes complete with a tiny Necronomicon! "One of my favourite authors, the grandfather of maddening cosmic horror, Howard Phillips Lovecraft. A homage to his writing, my first DIY action figure project is a hand molded, cast and painted effigy of Lovecraft, along with a copy of the fabled and despised Necronomicon! Each figure will come as part of a larger box set - including a copy of a comic I have written and drawn, a screen printed t shirt, a screen printed poster, badge and sketch, all in a wax sealed box These will be available very soon! email merrylinhouse@gmail.com for inquiries!" I'm totally in for one Alex, just let me know where to send the money! As a side note, are you aware of this attempt to revive the Columbus and American Italic fonts as a new font named Cristoforo? These fonts were prominently used in the Call of Cthulhu RPG. SHAREit is an Android app used as a file transferring application designed for Android smartphones. One could use SHAREit on the desktop versions too with an emulator installed on the PC. Experience the look and feel while sharing with PC as like the mobile version. Your sharing of this content is very interesting.